Lake Titicaca, the world’s highest navigable lake, most certainly makes its way onto the travel itinerary of individuals exploring the massive, yet equally diverse country of Peru. Unfortunately, most travelers overlook the Peru side of Lake Titicaca and are often advised by online sources or fellow travellers to minimize their time in Puno in order to maximize their stay in Bolivia’s Copacabana and Isla Del Sol. As such, many people I met throughout my journey on the Peruvian side of Lake Titicaca were spending 1 night in Puno, doing a quick tour of the island the next day, and catching the bus out of Puno that same night. The history, culture, and opportunity to exchange knowledge and learn from the local indigenous peoples on the Peruvian Islands of Lake Titicaca deserves much more than a 1-day tour! So, how to do you go about extending your stay on the Islands of Lake Titicaca when most tour companies offer a 1-day tour? We were set on going guide-free for our journey. From my 10 years of travel experience, I feel that tours are often rushed, miss important information on local culture, and further lack the opportunity to exchange and share knowledge with local people. My friend and I walked to the Puno port at 6:30am, found the ticket counter for Amantani Island, and after negotiating the length of our trip and desired stops, purchased our round-trip tickets. This included a short stop on the Uros (the floating islands), an overnight stop on Amantani Island, and an overnight stop on Taquile Island. The night before your departure, I would strongly advise purchasing snacks and water for the boat ride. Prices for food and water will increase as you leave the shores of Puno. Though departure times are listed, you will often face delays. Be certain to keep your ecological footprint down by carrying out all the plastic and garbage that you bring in to these island communities! A day backpack is sufficient for your experience on the islands and to make things easier, every hostel/hotel in Puno will store your bigger backpack for no extra fee. It is advisable to figure out a way to lock your backpack, as sometimes the storage area is open to everyone. I made sure there was nothing in my bag that was of value, and left my laptop in a secure locker with the owner of the hostel. I would advise packing your basic toiletries (toothbrush, toothpaste, toilet paper, soap, hand sanitizer), sunblock for face and body, sunglasses, mosquito repellent, and a cloth bag that you can empty out your belongings in and leave in your room while exploring the island. 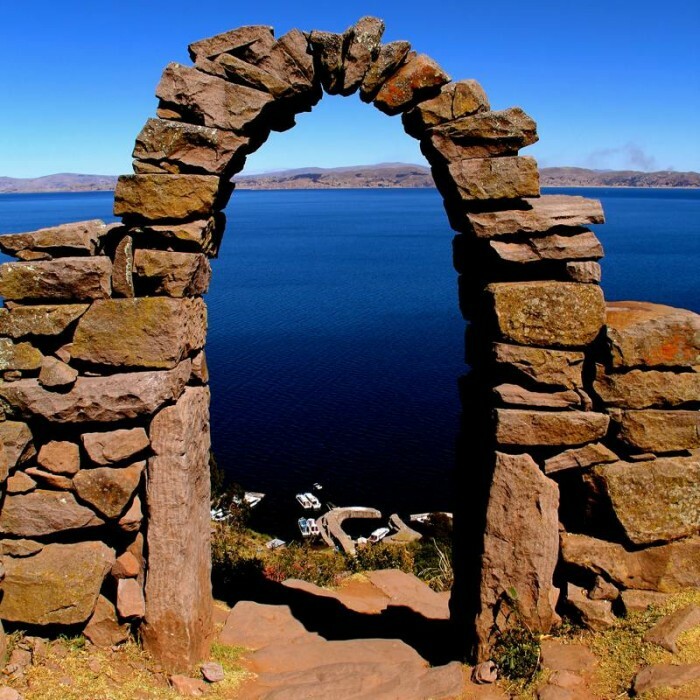 This island is filled with rich indigenous culture and spectacular views of Lake Titicaca, which looks like an ocean! Upon arriving on the shores of Amantani Island, our fellow boat passengers departed with their pre-arranged home-stays. We were immediately greeted by an elderly woman, who asked us if we needed a place to stay, and just like that walked us to her home. We had a wonderful 3-bedroom room to ourselves, and were served with a delicious quinoa soup and a potato dish for lunch. What I enjoyed the most from my visit to this small island community was our conversations throughout the late afternoon and early evening with our host family. We learned so much about their life, work, and the challenges and opportunities of living on the island. In order to fully enjoy your time on Amantani Island, you will need to have some level of Spanish skills. I would recommend purchasing the Latin American Spanish Phrasebook, as it is well organized and designed for the purpose of travelling. It is also a perfect book to pull out when you have spare time on your travels! Lastly, due to the high altitude of this region, be prepared for extremely hot days followed by very cold nights. Bring layers that you can easily add on as the temperature falls. Gloves, a scarf, thick socks (men, women), sweater or fleece (women, men), and a windbreaker (women, men) are necessary in the winter months. Though our host family provided us with extra blankets at night, I slept with my thick trekking socks and sweater! One thing I wish I brought along with me was a small gift for my host family. This does not need to be something expensive, as it is truly the thought that counts. Thinking back, I would’ve loved to bring some fresh fruit from Puno or pencils, books and hairties for the kids. Many people who spend time on the Peruvian islands spend the night in Amantani and do a day-trip to Taquile. If you have the time in your schedule, I would most definitely recommend spending the night in Taquile, as the culture, local indigenous traditions and knowledge is vastly different than Amantani. Taquile has a tourism system that is foundational on community and sustainability. You will see that the local restaurants and home-stays are mostly communally run. Therefore, our home-stay was more or less similar to a hostel experience that was run by the community. What I enjoyed most about our time on Taquile was the interaction with local women and children in the central plaza. As soon as the day-tours left the island, between 1pm-3pm, the island has an atmosphere of peace and tranquility. There are many shops that you can get snacks or a quick meal from, but ensure that you have small bills/currency, preferably nothing higher than a S20 note. You will notice that the island communities will not have change for larger notes. With stunning views of Lake Titicaca, unique architecture and agricultural practices, and the culture that is displayed through peoples attire and living style, you will want to ensure that you bring along a camera on this journey! Make sure it is fully charged, whether you are using your phone or a camera, tripod and/or monopod, as it is near impossible to find an outlet. You will probably need a large portable charger for your phone or camera even if you are planning to stay for only a couple of day. With that, also ensure that you bring along a headlamp or torch (and extra batteries) because when the sun goes down, you will need it to navigate whether you are going for a walk or simply going to the bathroom! I absolutely loved spending the night on Taquile because I had the opportunity to explore and at the same time take pictures of things I would’ve missed on a quick day-tour. 3,800 meters above sea level!? Will I get altitude sickness!? Many people suggest that you will need altitude sickness pills during your visit to Lake Titicaca. Everyone will experience altitude differently. Always ensure that you are hydrated as the symptoms of altitude sickness are similar to those of dehydration. If you have given yourself time to acclimatize (have spent time anywhere from Arequipa, Cusco, to La Paz), you will most likely be okay. Though it is a good idea to carry altitude sickness pills, which can be purchased at any local pharmacy, just in case you feel sick in those first 5 hours of arriving in a new altitude a great local and natural alternative is Coca leaves. Most hostels will provide you with coca tea and it is easy enough to buy at any corner store. The other option is to chew on dry coca leaves, which works just as well as altitude sickness pills. Just be sure that when you are crossing any international border, leave the Coca leaves behind because they are illegal elsewhere! Though most people skip over to the Bolivian shores of Lake Titicaca to enjoy the beautiful Isla del Sol, there is no doubt that the Peruvian shores of the island have so much to offer. My time boating through the island communities of Lake Titicaca in Peru was my most memorable moments from my 2-month journey in Peru!